Burwalde Woods is the main facility used by the club, including the Jackrabbits. There are trails for both classic and skate skiing. Club membership fees support the operation and maintenance of these trails. Burwalde Trails is located between Morden and Winkler, three miles north of Hwy 14 or nine miles south of Hwy 23. 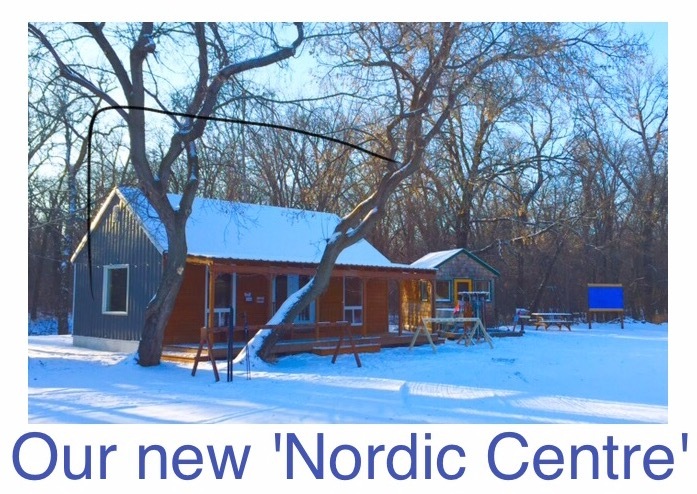 The main trailhead is accessed from the Froese’s yard (home of Burwalde Woods Honey). There is limited parking space; please park tightly so there will be room for others. A donation box is located at the trailhead for non-members to contribute. Please Note: Burwalde trails are only open for cross-country skiing. NO DOGS and NO WALKERS are permitted on or beside groomed trails. There have been additions to our trail system in the last few years so refer to the map link below. Our main classic loop is a 5km trail that combines Main, Northwoods, Pigtail and Inner Circle. These four trails flow together and can be skied as one loop. They are all one-way trails. Outer Limits trail, formerly just a skate loop, now has a parallel classic trail. It is about 3.5km long and can be skied either direction. The Creek Trail is a 5km touring classic trail that is accessed from Outer Limits. It is an out-and-back trail so the entire trip is 10km. Finally for the romantics Skiing Double is a 1km flat trail that follows the creek bottom starting at the main trailhead or accessed off Outer Limits. It is groomed for skate and classic and can also be used as a link to the Creek Trail. For the skate skiing the short 1km Inner Circle can be linked with the 3.5km Outer Limits (skate) and the 1km Rollercoaster. Our clubhouse provided by the Froeses is getting an expansion and facelift this winter. It is open for all organized BTNC club activities but not for everyday casual skiing. Hoppin’ Hollow, a freestyle ski terrain park located right beside the clubhouse, is open to any young at heart skiers whenever the Saturday Jackrabbit groups aren’t using it. The hills are small but it still is a great spot to tune-up your ski balance. Ski rentals are available in the Nordic Centre which is open weekends and occasionally during the week. Much of the equipment has been donated by club members; please use it with care and only at Burwalde Woods. Current daily rates for use are $5.00 for adults and $3.00 for youth. We also recommend a trail use donation of $5.00 for adult non-members. Please return skis to the proper row and boots to the proper shelf to make it easier for the next borrower. Are the trails open to the public in the evenings after 6pm? And are you open this Saturday the 19th? Do you have to call ahead and reserve skis? Is there any place that you can rent & snow shoe? Are the trails open to the public – non members tomorrow January 5th? Just wondering if your trails are open today and if we are able to rent equipment? I saw your ad for volunteers needed and would like to fill a couple spots this year. Please let me know of the next date and time! Hallo I am wondering if the skies are available Today, and if the trailes are good today? And I also heared that you have free skiing this week, is that still available? Jan 31 what are trails like today been groomed? just checking in to see if the trails are open? Will trails be open this evening? Are the trails open to the public in the evenings? We are interested in trying some cross country skiing to get a feel for whether it is something we would like before buying our own equipment. We would like to try Burwalde and rent equipment … were thinking we would have time during the week, not sure when it is open and could be accessed (imagine we could not make it happen on short notice). Feb 14th, Sunday. Are your trails open today for the public?We had some snow last night. I’m looking to start my kids in cross country skiing. We are beginners. I have 4 children, 13, 11, 8, and 6. We are home schoolers from Morden. How is the best way to start? When is the distance challenge this year? Yes, much to our surprise, and after the worst winter for lack of snow that I’ve experienced we now find ourselves planning an event we never thought possible as recent as a week ago. Trying to get snow to firm up in March when it lands on dry ground is a challenge but we plan to go ahead with a similar format to last year albeit some of the more exposed trails may not be useable. I hope to get some information up on our club site tomorrow and also forward the basic outline to Karin. Currently it looks like we may be heading to a slushy event but our snowpack appears heavy enough to handle a few days of melting. Shannondale Trails for March 24, 2019. dgl! Shannondale , March 18 to 24, 2019, dgl! Shannondale! Mar 1, 2, 3, all trails GO! dgl! Shannondale, Feb 22, 23, 24, Trails are all groomed ! Richard Unrau on Shannondale Trails are best ever ! March 9, 2018. dgl!